A BATCH OF Tesco Organic Almonds are being recalled by the grocery giant due to the presence of Salmonella. The Food Safety Authority of Ireland (FSAI) said that 200g bags of nuts with a best before date of February 2019 and a L8004010 batch code should be returned to a Tesco store. The almonds originated in the UK and Tesco has issued in-store notices requesting customers who have bought the implicated batch not to consume them. The FSAI has also issued a withdrawal alert about a range of Tullyard Farm meat products because they were processed in an unapproved facility. The products are incorrectly labelled and carry inappropriate identification marks. No other Tullyard Farm products are known to be affected. Email “Tesco organic almonds recalled due to presence of Salmonella”. 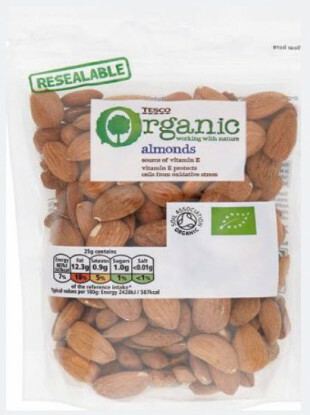 Feedback on “Tesco organic almonds recalled due to presence of Salmonella”.